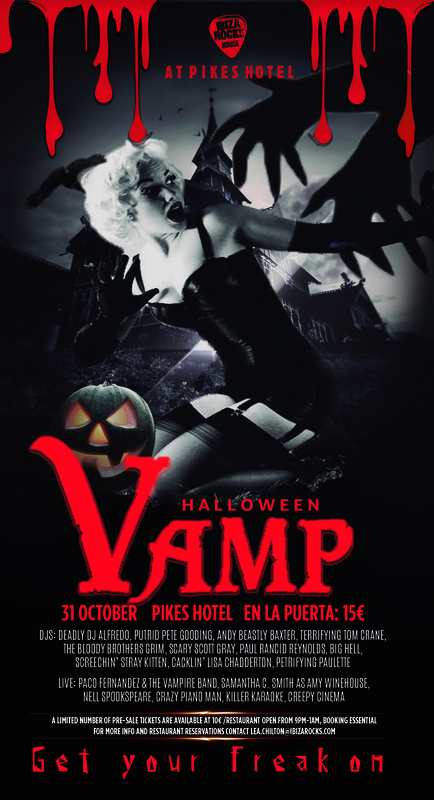 It’s that time of year again, the witches and the vamps are out and about and Halloween in Ibiza has turned into one giant excuse to party, nowhere more so than at Ibiza Rocks House at Pikes Hotel.Saturday 31st October is the devilish date for the diary with a monster line up of DJs, live entertainment from dead rock-stars and cauldrons full of spooky surprises from 9pm until the creatures of the night go back underground. 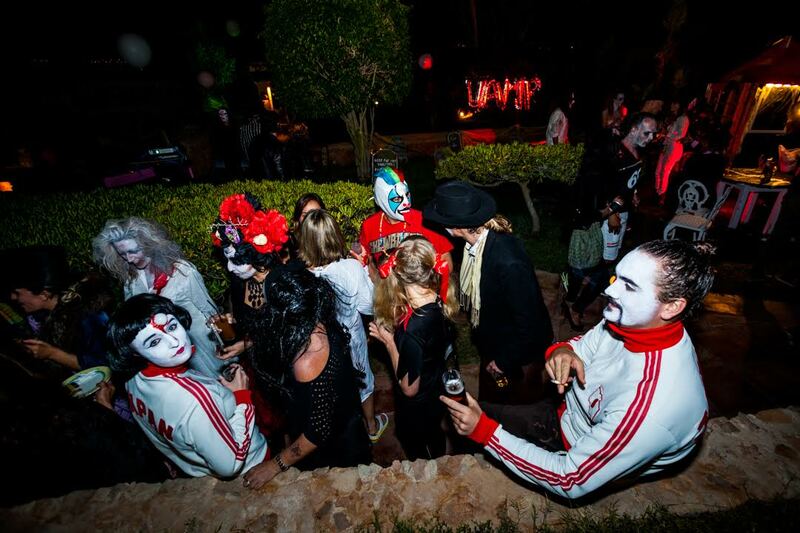 Under the name of VAMP, this is the 4th year that Ibiza Rocks House has been transformed into an authentic hotel of horror, placing itself firmly on the rowdy route of Halloween High Jinx on the island. As far as the music and entertainment is concerned, organisers Leanne (Queen Vampire) Chilton and Jillian (Back from the Dead) Canney, have cast more than just the one magic spell and conjured up a line-up of some of the island’s finest DJs and musicians to keep the creepin’ crawlin’ critters on the dancefloor from 9pm till the wee small hours. Leading the DJ Army of Darkness, one of Ibiza’s greatest, the absolute legend that is DJ Alfredo Fiorito, joined by fellow islanders Andy Baxter, Tom Crane, Pete Gooding, The Brothers Grim, Scott Gray and Paul Reynolds (Melon Bomb), Stray Kitten and, of course, the Ibiza Rocks House summer residents 2015, Lisa Chadderton and DJ Paulette. Spread across Chez Fez and Freddie’s Bar, expect a monster mash-up of house, hip hop, funk, rock n roll and everything in between as the night gets naughtier and the freaks get freakier. And that’s not even the half of it. As far as live music goes, Paco Fernandez and his band will take over the Plaza early bells, whilst inside the haunted house, the sultry sound of Samantha Carrie Smith as Amy Winehouse will fill the air from midnight. On top of that, guests are invited to get their best screeches ready for Sunny’s Killer Karaoke. Party-goers should also be prepared to have their ivories tickled by Crazy Piano Man, Roberto Campoli, on the putrid Pikes Piano accompanied by one of the island’s favourite vocalists, Nell Shakespeare. Fans of freaky films will find a suitable space dedicated to spine-tingling cinema classics throughout the evening. This, as well as all special effects and projections, will be brought to the hotel by lighting professionals Aladdin Lights. For those who have an appetite for more than just blood and guts, Pikes Restaurant, Room 39, will be open from 9pm serving up a feast fit for any fiend. Places are limited and booking is essential. 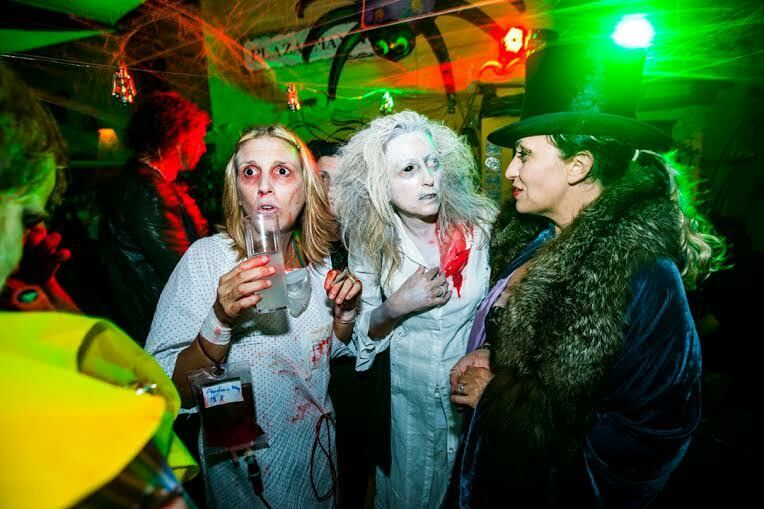 With prizes for the best costumes and spooky surprises at every creepy corner, this is one event that will return to haunt your nightmares- in a good way- for a long time to come. Fancy Dress is absolutely obligatory!